A magazine for people who love technology, especially the internet, mobile, truly great personal computers, and related fields influenced by technology such as photography, publishing, music, and even coffee. Rather than telling readers everything that happens in technology, we deliver meaningful editorial and big-picture articles. The Magazine publishes an issue every 2 weeks, usually with 4 articles of 500–1000 words each, to subscribers. The Magazine is sharply focused on just the writing, and the writing in the first issue is excellent. 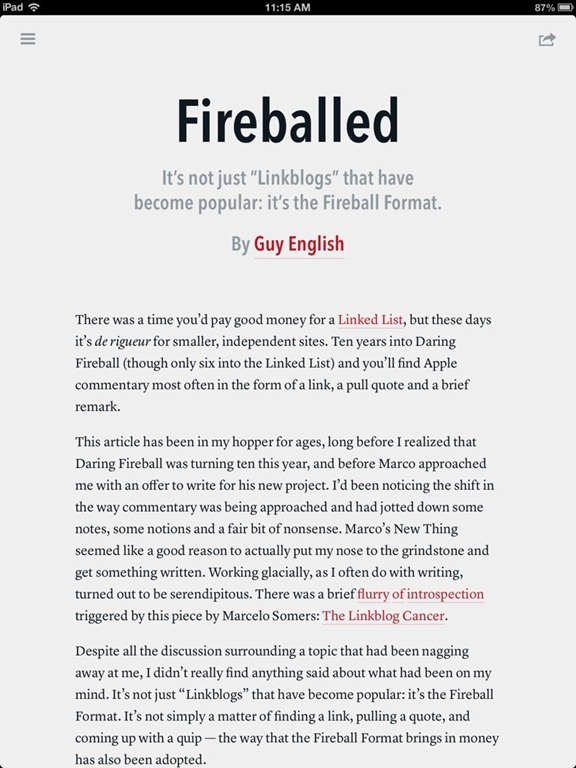 It’s a great read, presented in a simple, elegant interface. 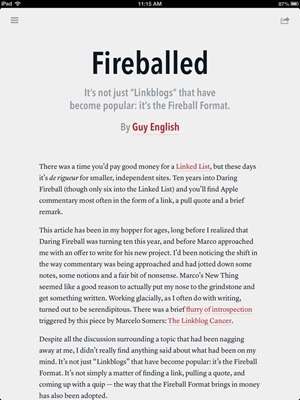 I especially enjoyed a piece titled ‘Baseball Misfits’ by Jason Snell of Macworld – which is about being a geek and a sports fan and some funny offshoot topics. … But I don’t consider The Magazine to be a member of “the magazine industry” any more than blogs are members of “the publishing industry”. Those terms evoke the old and established, while this is the new and experimental. “Magazine” also evokes the legacy technology of printed paper, and the massive overhead that comes with it. The Magazine will probably never have a paper edition, but making a truly modern magazine goes far beyond just omitting paper. 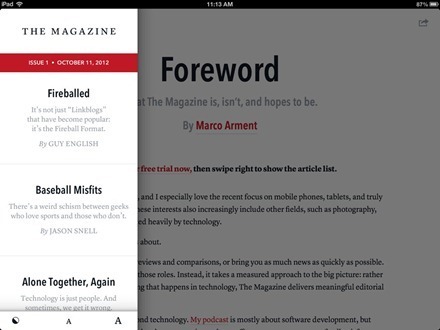 Many iPad magazines are carrying unnecessary and expensive baggage from their print days. Some born-digital magazines even took on print baggage simply because they thought they needed it. The Magazine’s articles won’t be laid out separately for portrait and landscape orientations. 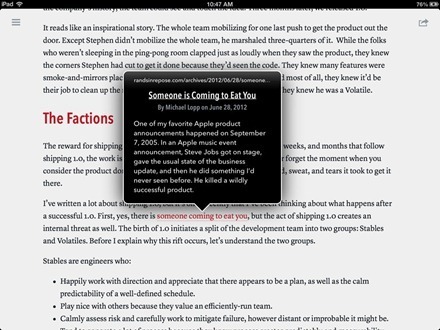 Articles won’t have custom designs at all. You won’t see any infographics, slideshows, or interactive panoramas. These multimedia features can all be valuable, and they have their places in other publications, but not here. That ‘utmost respect’ really comes through when reading The Magazine. 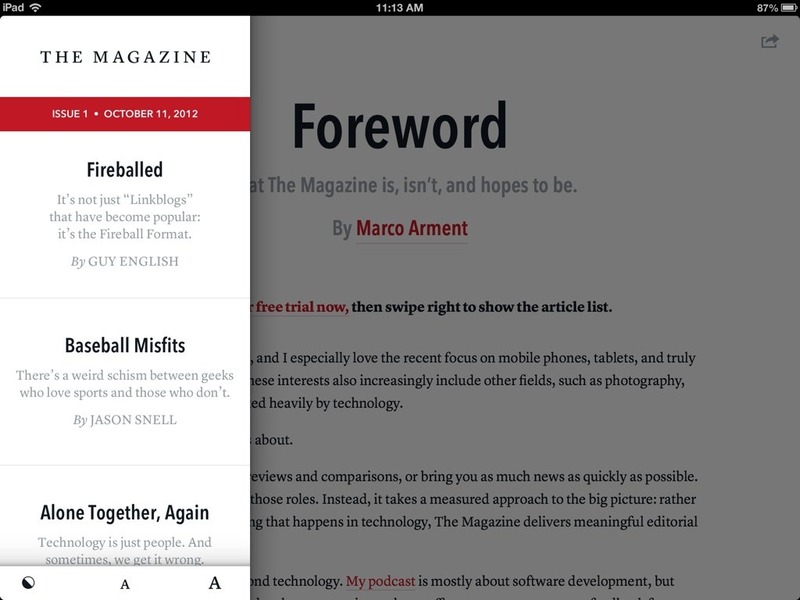 The ability to select and work with text is very rare in iPad magazine titles and great to see. 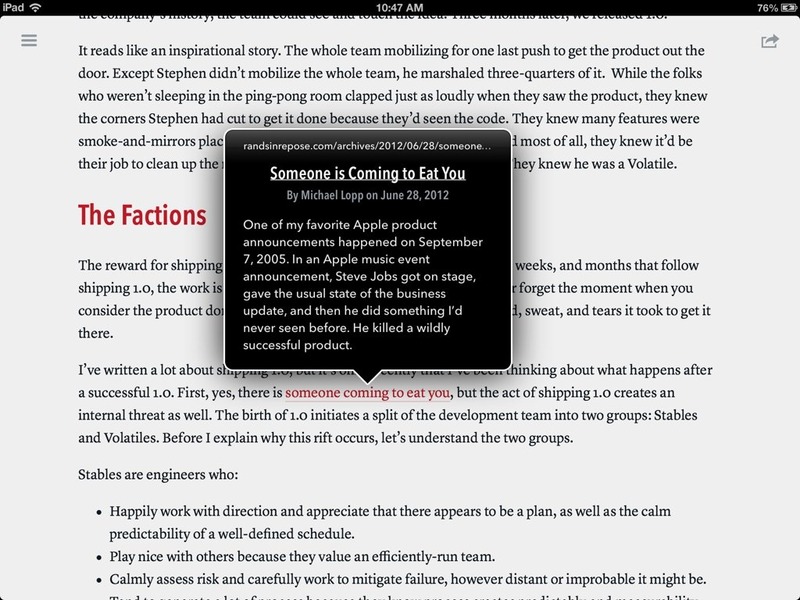 As are the clever popovers for footnotes within articles, and the choice of nice light and dark themes. A subscription to The Magazine is $1.99 a month, and there’s a free 7 day trial. All of this is a bit crazy, and it’s not guaranteed to succeed. But I bet it will. Like many others, I think it’s a crazy good idea. And judging by its first day results that bet of Arment’s is looking good. Here’s an App Store link for The Magazine; it’s a free app with subscription options as mentioned above.